« P&O Ventura refit – in Hamburg? Most of the points there we knew already: that paying a Vantage fare gives you flexibility, choice, some benefits, deferred payment and possibility of getting at least some of your money back if you have to cancel, while with a Getaway fare you don’t get any of these but you do get a significantly-lower price. But there’s a new difference in there: ‘Shuttle Bus fees included’. Vantage Fare passengers will get free shuttle buses, Getaway Fare passengers won’t (at least not from April 2014). So what’s the big deal? Well, for me the provision of free shuttle buses has been one of P&O’s big advantages, even though it may seem a small benefit. I know that when I’ve been on cruises with lines that charge for shuttle buses the cost has really rankled with me – I remember on Celebrity cruises we had to pay $10 each for the shuttle from Tourlas harbour into Mykonos Town which isn’t much more than a mile! And it wasn’t even properly into town…. 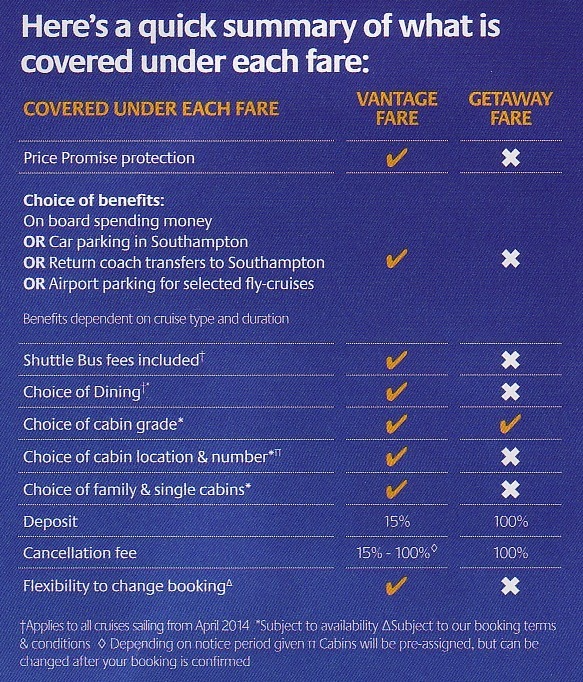 So I’ve always enjoyed the ‘free shuttle buses’ thing on P&O. One part of me is thinking “Good! Serve them right!! Stuff that up your cheap fare!! !”, although I also recognise that an external observer might observe some pettiness in such thoughts… Another part of me is wondering how P&O are going to manage this – will Getaway passengers have a differently-coloured ship pass so they can be identified? Will this lead to Vantage Fare passengers being tempted to show off that they’ve got one of the classier ones? – and also wondering if this is going to lead to unpleasantness. I have a feeling it might, on the first port of call at least. We have travelled with Fred. They charge for shuttles, unless you are in a suite. we were in a suite, and were given vouchers for the buses. Those who had to pay were given tickets, before boarding. therefore no one really knew if you had paid or not, as you were all handing in tickets on the bus. Thanks for the comment, Rosie. I think P&O will have change their procedure when this policy is introduced. At the moment, because the shuttle buses are free, there’s no check of anything, really. Once or twice (generally on the return trip) someone has been checking that boarding passengers have in fact got cruise cards, but that’s been all. Generally it’s been turn up (or wait in a queue) and then scramble on. I see the above table shows in the small print that the shuttle bus fees and the choice of dining only becomes exclusive to vantage fairs in April 2014. Therefore Getaway passengers for the next year should have no need to be identified differently. So they really are excellent deals for now. As I understand it, the introduction of charges to Getaway pax for shuttle buses will only be for those buses provided by P&O themselves. At many ports the buses are provided by the local port authority (due largely to safety issues I believe) so I assume that these will remain free for all pax irrespective of the fare paid.